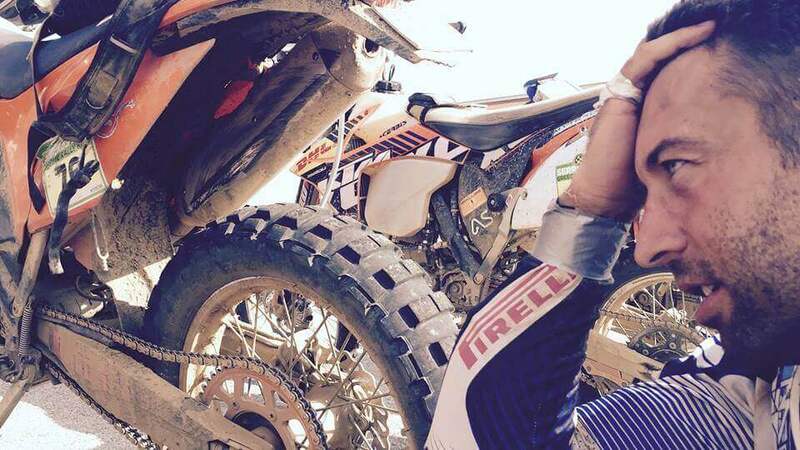 Andrei, About Serres Rally: Why Does It Have To Be Hard? Even the title can be seen from two different perspectives with two opposite meanings. Just like that - to be difficult to understand. 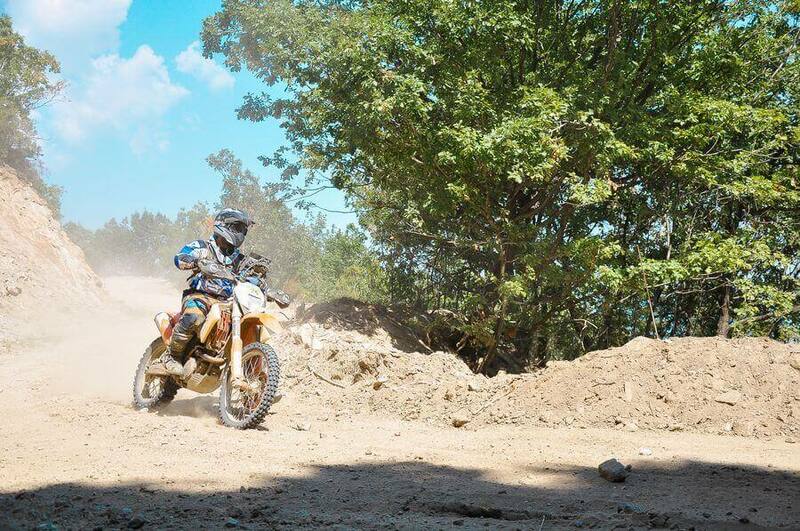 I’ve thought of writing about my experience with Serres Rally 2016 in my own words. 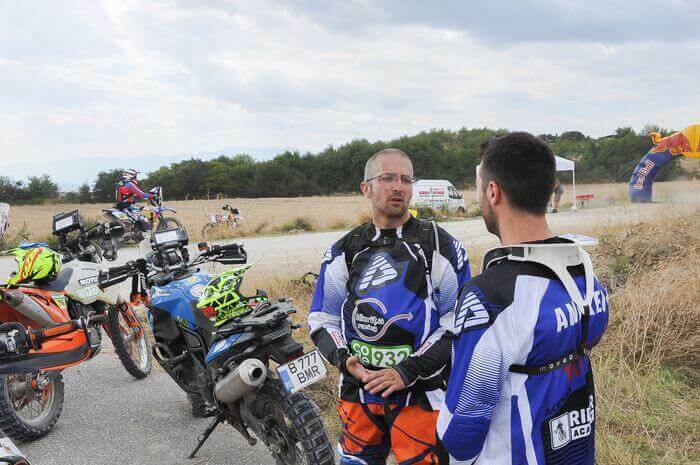 Then today I met a friend who asked me how Serres Rally was, or better said, how the rally was. No one knew exactly where I was but they knew it was a rally. Andrei before the rally. Poor guy, he had no idea what was about to happen. It was hard but it was also very very beautiful. And I believe that it wouldn’t have been so beautiful if it wasn’t so damn hard. I made a parallel with the friend who asked me how it was because the talk I had with him gave me the idea for the title. In a world in which everyone’s looking for comfort, for simple and efficient ways to get results, for the cheapest, fastest, better offer... how could you possibly explain why you’d pay a lot of money to go to Greece and struggle day and night, fall and crash, barely eat, get tired beyond any limits and cry of joy when you finish the race on the 64th place? It is exactly like that time when I wrote a comment on Facebook to a photo album from Romaniacs. There were pictures of bikers full of mud, wailing and struggling, who were pushing their motorcycles with all their remaining strength in order to get over another obstacle, being aware that after this obstacle, there were going to be others, bigger, harder. If you don’t know why they’re doing this, I don’t think that you will understand. 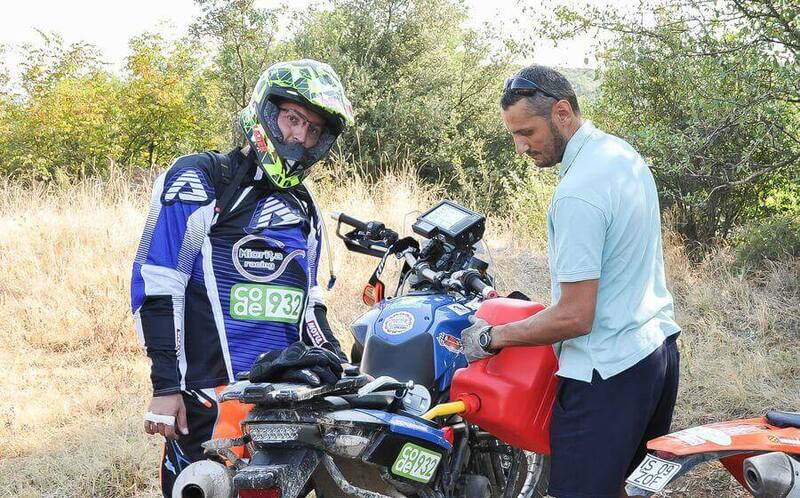 I started this idea about participating in Serres Rally as a joke, with a phone call to Marius, one night when I was dreaming about Dakar, but at least I had the common sense to be afraid to think about it very seriously. 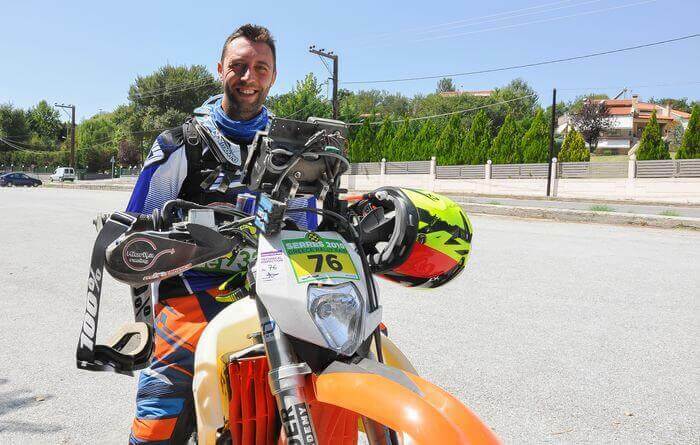 ”What do you think about participating in a moto rally?” Look, I’ve read on the Internet that there’s one in Greece, in Serres.” M​arius, with the same attitude ”How hard could it be?”,​ he said that it was a good idea. The interesting part is that I believe that if I ask him now, his answer would be the same. As we were informing ourselves and we were trying to find out from other people with much more experience what a rally means, I started to get scared. When Mani Gyenes explains to you how you should calculate the delays based on how bad the fall is, how to take with you all kinds of things because when you fall at high speed it is possible to break something in your motorcycle, how to drive slower (120km/h he said) because you need to pay attention to the navigation… I was thinking to myself that we won’t be interested in the place we finish on, that we hope to finish the rally and that we will drive slowly. I started the serious trainings with approximately four months before the rally. I was really inspired to do so. 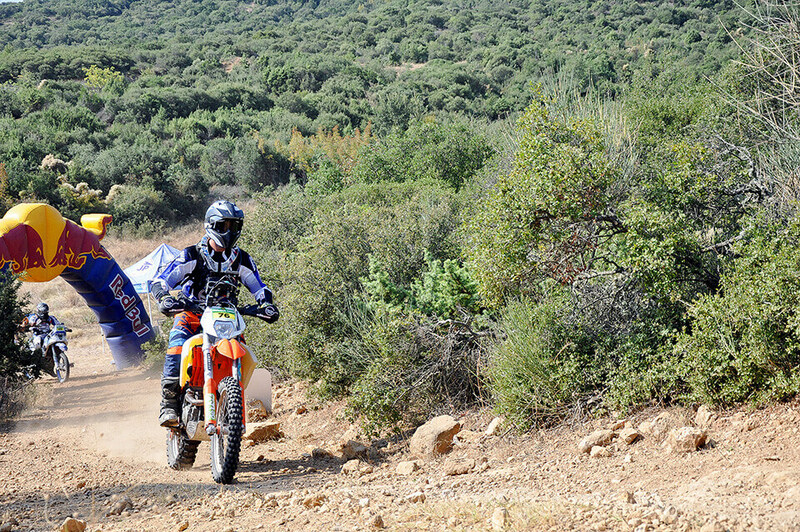 Your fettle is not something to ignore when you’re thinking about participating in a rally. It will definitely drain you of energy. Besides the good fettle it gives you, a serious training teaches you not to give up. Start to count your reps when your muscles begin to ache. I think that Muhammad Ali said this once and I remembered it during my trainings. Healthy food, supplements, vitamins, no alcohol, more sleep (anyway the trainings drain your energy). It is not a joke. My friends were making fun of me when we were going out because I was drinking three-four-five bottles of still water. I also laughed :) Before going to Greece I started running. I hadn’t been running from high school when I was forced to do it in sports class. First time I ran for four kilometers and it was very easy. I even talked to Marius on the phone during the first half of the running session. After a few days I ran 8 or 9 km. I thought to myself it meant I was in good shape. More about this later on. The thing is that it was hard. It was hard to restrain myself from everything and to push myself despite of the muscle soreness because I was always thinking that I had to. It was not something extreme, but it definitely wasn’t comfortable. I did some trips to Bucharest, I got my motorcycle ready, we met the sponsors. Here’s another awesome thing. We had sponsors thank to Marius and Mihai. We had to print stickers with the sponsors’ logos. Awesome feeling! I was already feeling like Rossi. 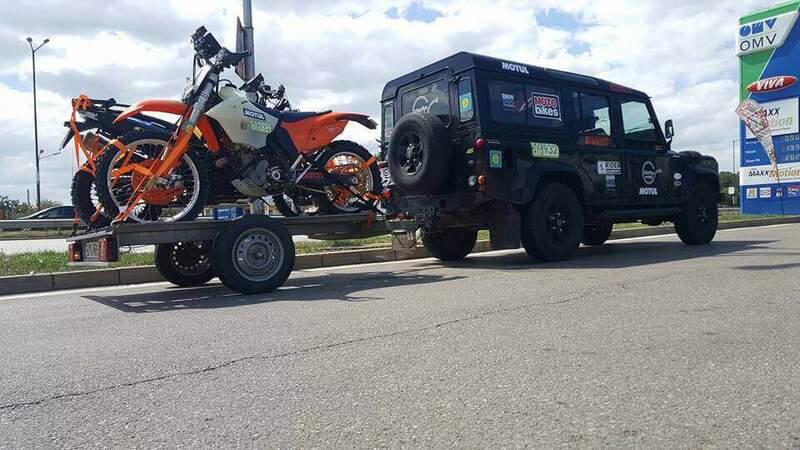 ”So we’re really going, right?” Miorița Racing is close to its destination. When we got to the bivouac (the base camp of the rally) I was speechless. 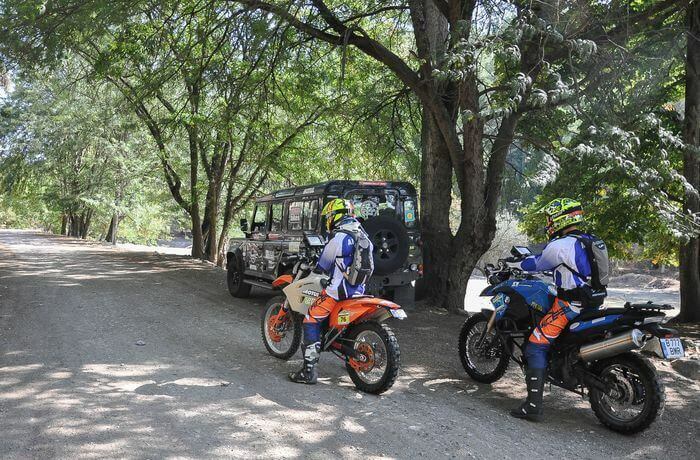 The ”easy” rally, not very important worldwide, had a bivouac full of assistance cars, tents of the teams where dozens of mechanics were restlessly screwing and unscrewing on some motorcycles much much much more well prepared than ours. I started to ask myself ”Dude, are we really doing this?”, but not out loud. We went to the first briefing, I received the first roadbook of my life, we started to highlight it with our pencils we brought with us, the staff explained to us what we should do in the calibration tour… everything was happening so fast and I started to be confused. I decided to go to sleep that night being sure that all the thoughts would be clearer in the morning. It’s gonna be fine! The moment of the first start has come. :) This is awesome. The RedBull gate, like the ones I used to see on TV, was waiting for me to pass, to receive my timecard and wait for the countdown. My heart was the size of a small peanut, but it was beating so fast. And BAM! The seconds passed, come on… I took off. What do I do now? I do what I know best. I get completely lost :). In a 35-36 km tour, I managed to make almost 60. 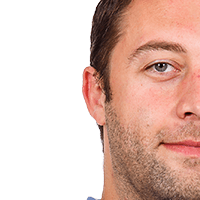 Tons of penalties. Nothing mattered except for getting to the hotel and going to sleep. Or to do something that I know how it’s done. The navigation discouraged me completely. I didn’t know where to start and where to finish. I was more lost now than I was in college, in the analytical mathematics class. I thought that it was how it should be. It had to be hard. I was sure that it was the same for the others. I’m having difficulties finding the road, I come to a crossroad and what a surprise! Marius! I cannot tell you how happy I felt. It was like I was in the middle of the ocean and a helicopter came to my rescue. Marius told me that he found it easy to use the navigation so far, but he was having difficulties with lifting his motorcycle from the ground. Good. The perfect team. We wandered some more until a staff member came to retrieve us. Apparently we were the last ones. Not only the last ones. We were the very last ones! There were no others like us! Andrei, full rally force! Stefan Svitko, get off the way! I was happy that someone had mercy and pulled us out of there. We got to the hotel, we skipped the shower and dinner and we went to the official start. Somewhere on a pedestrian street in Serres, nervous again. I was counting the motorcycles like I was in the first grade. ”76 Andrei Dănilă from Romania” :). I went up the starting platform, they asked me some things, I answered something and that was it. It was nice. There were people that were looking at me and they were thinking that I knew what I was doing. I was chicken-hearted because I knew that the next day I would have to navigate for 220 km. How could I possibly get lost so badly today? Why didn’t all the others get lost like I did? I am the last one on the leaderboard. ”Are we really here? Are we really doing this?” It is harder than I thought it would be. The next day I woke up with a plan. Quitting was not an option, neither was not succeeding. I have to find a solution. I follow Marius and I’ll figure out the whole navigation thing. This is not possible, all the others have understood. I have to get this. No sooner said than done. I am the last one starting the race like I deserve :), and I ride fast to catch up with Marius. I forgot to mention that I also got lost on my way to the official start, the evening before. Lucky me that I saw where the other participants were heading to. :) The odds were in my favour! So I start again. I was already used to the timecard, stopwatch, the RedBull balloon… I ride fast, accelerate, I take two or three curves and what do I encounter? Marius lying on the ground was pulling his motorcycle like a fainted donkey. Damn! We pull it out of there and we agree that he takes a different path and we meet after that. And so we did. I rode for 40 km in... I don’t even know how much time and I started to get the whole navigation thing. I still hesitate with the navigation but Marius was in front of me and he was analyzing the route so some things started to be more clear for me and I was beginning to understand that it was not that difficult. As we reach kilometer 45, we meet another completely lost rider. We talk to him, he tells us that he got lost and he starts following us. So I pick up my heart, I repeat to myself a couple of times that I can do this, I let Marius know and I get in first. Our new friend follows me. Now I start to feel competitive. I tread on the gas and I leave him behind. At least that’s what I think. Every time I slow down to find my way, he appears again. I tell him to pass in front of me but he lets me know that he doesn’t want to. I didn’t understand anything. Besides the effort of getting the whole navigation thing, I had someone who was pushing me from behind. When I write this here it seems easy, but it felt like a punishment. Me, who was telling Marius hundreds of times to ride slowly, at his own pace, I was riding so slow so I could get rid of the rider that was following me. I found out later that there was no chance of that to happen. At some point, when I stop to work out an instruction on the roadbook, the guy comes close to me and tells me that his ICO cable broke and he doesn’t see the odometer. It’s weird how everything changed in my mind in a split second. From the public enemy number one he became a race buddy with a problem. 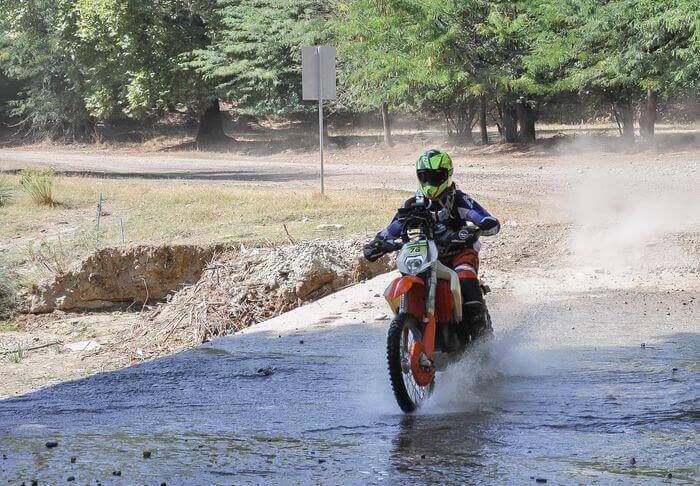 I slowed down, I was really careful to choose sections with less dirt and we rode together to the finish. I classified the second day of the competition a success. I finished the race. The weird thing is that I was again one of the last who finished and there was nothing glamorous or encouraging anymore. The two guys with the timer were bored and eager to go get some beers but there were some lost riders on the route and they had to wait for everyone. I got the the bivouac and I made acquaintance with the guy I helped with the guiding. His name is Carlo Seminara. 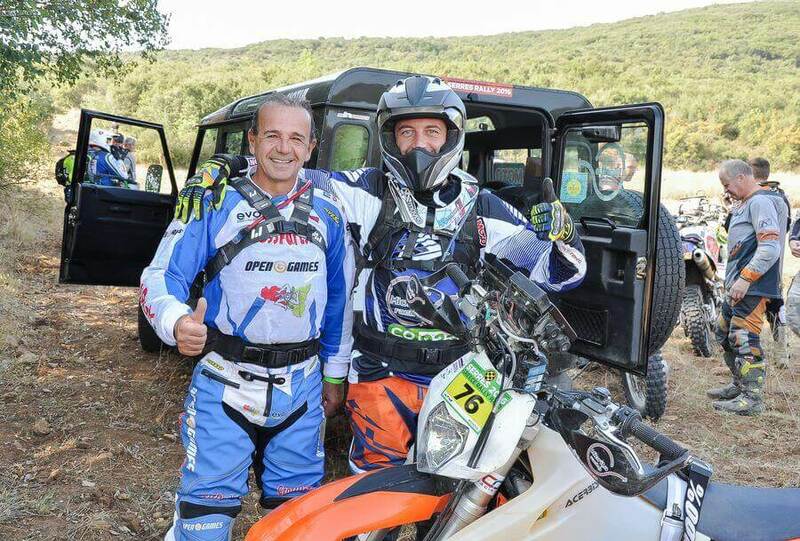 He is a gentleman who participated in Dakar twice and who proved me later what the rally rider’s character is like. In order to thank me that I waited for him during the competition, he asked his team to help me change my tires and later with many more. About the rally you need to understand that it’s not a competition like any other. There is respect and a special connection between all the participants. You pass by a worldwide top 10 rider, he smiles at you and he asks you how your day was. If they see you covered in dirt and tired because you just arrived to the finish after a tour that they finished many hours before you, they tell you some encouraging words and they wish you luck for the next day. They fight in a different league. When they pass you by, they defy every law of physics that you know. When you hit the brake, they accelerate, when you pick up your motorcycle from the ground, they put it down on the ground. It’s incredible to see them riding. Bogdan aka great technical support that we don’t even deserve. 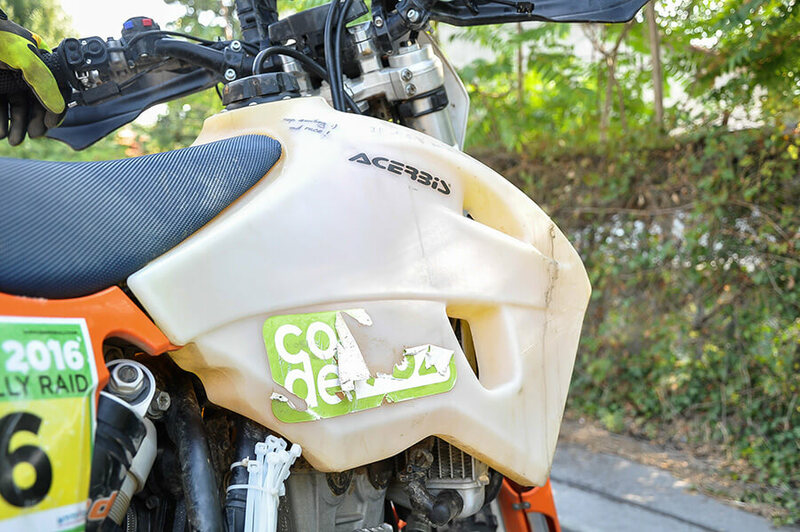 Here he refuels Marius’s motorcycle before the third day start. We improvised quite a few things. We were extremely lucky because we managed to solve all the mechanical issues before each start. We learned that the motorcycle has to be really well prepared for this kind of competition. 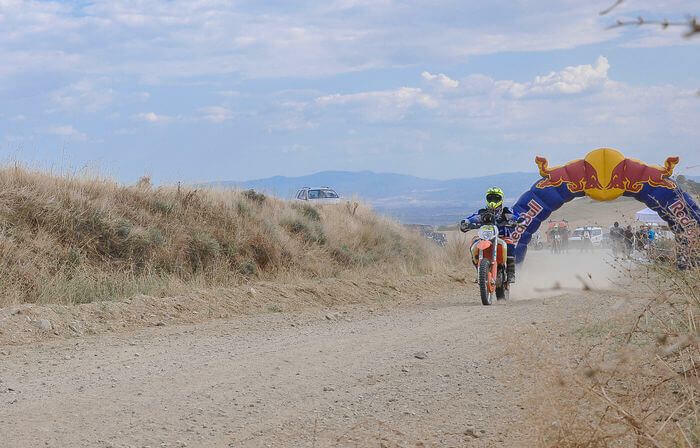 Like Carlo said, a rally is a competition that depends on two elements: the man and the motorcycle. Both have to make it. What can possibly happen? The motorcycle is ok. I tell you what can happen: You fall and the connecting hose between the gas pump and the gas tank breaks. The motorcycle doesn’t have enough power. The heart rushes because your mind tells you that the clutch has broken. My diagnosis skill was a bit lower than my orientation skill. :) I stopped and there was gas everywhere. It took me 4 or 5 minutes to cut the hose to make it shorter and to go on. While riding, a screw that holds the handlebar riser breaks. Imagine that while you’re riding with 50 km per hour, you end up with the handlebar in your hands :). What do you do then? You clench your teeth and fall. Then you tie your handlebar with 15 zip ties (you need to have thousands of zip ties with you because you can repair anything with them), and you rush to the filling station. On your way there you think of all the possible scenarios, you calculate and inventory everything in order to find a solution. I was lucky that I could simply eliminate the handlebar risers and to put the remaining screws somehow so that the handlebar would fit. Climbing, accelerating, there follows a climb-down with many rocks. You wanna change to a lower speed in the gearbox. Bad luck! There is no gearbox pedal. It fell somewhere :). There’s no problem, I think to myself, I have a spare one. It’s just that I don’t have a screw to fasten it. I have 80 km left to ride in this special route. I analyze the situation, I use the spare pedal to shift into third gear and I ride like this for the rest of the day. Uphill-downhill, third gear. The climbings are the funniest. Everyone chooses the safe, technical traces, the second gear or even the first gear and there comes a guy from behind, full speed, because otherwise his engine would stop, and he jumps from rock to rock like a chamois. I’m sure that I amazed some riders from the bottom of the leaderboard as I passed by them, with my climbing techniques in the third gear. 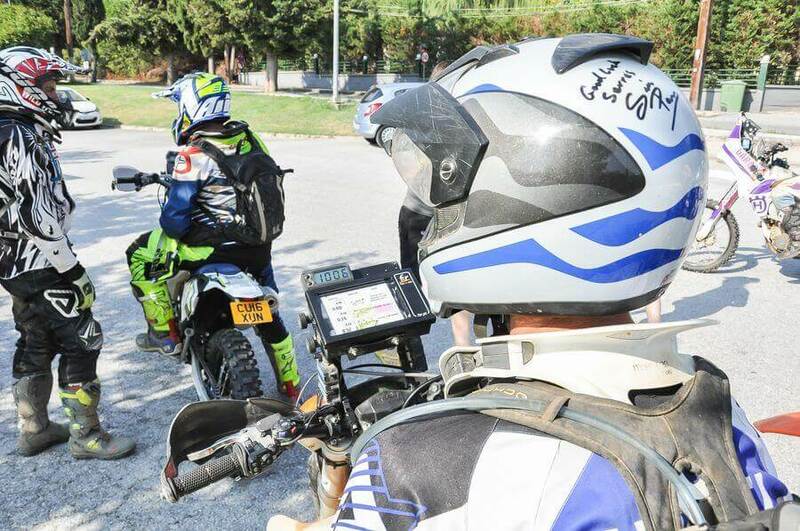 Another day, I follow Carlo, I already have a good speed and I use the navigation without reducing the speed at every point on the roadbook; I realize two things: first off, on off-road not every trace has a finality. It can end abruptly into a pothole. And second off, a bit more critic, the brake fluid DOT4 is not for competitions. Especially when you ride fast and you hit the brakes suddenly, it overheats and the brakes won’t hold anymore. :) What a pleasant surprise to find these two things combined. The front wheel gets stuck into a crevasse in the road and the motorcycle simply stops from 40-50 km per hour to 0, all of a sudden. No problem. I stop with the navigation on my chest, all the air from my lungs gets out, and in just two minutes I’m able to breathe again. All this time I shout like a little girl stung by a bee. I didn’t know what to do, how to control myself. All these things you do them on the fly. Something tells you that you have to go on. You cannot stop. You can cry and shout while riding, it’s as comfortable as it would be if you stop and pity yourself. Anyway, this cannot be seen in the photos. The layer of sand on your helmet and glasses protects you from the shame of seeing your tears in photos. Everything is ok.